It’s rare for me to use things for their intended purpose. By nature, I look at things with unorthodox views. 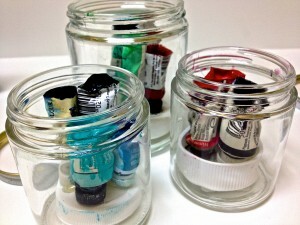 Why not use what’s dried in the watercolor tube? 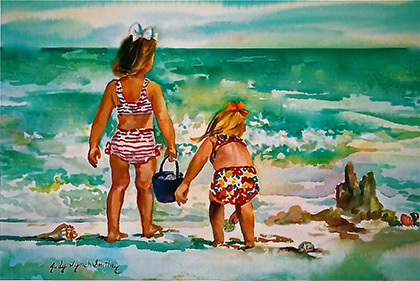 It may not be much but in today’s economy, artist’s paints are too precious to waste. I simply cut the bottom out of the tube, and hot glue the tube upside down on top of a lid discarded from old meds or jars. Then I mix a few drops of Gum Arabic and water to the paint in the tube. 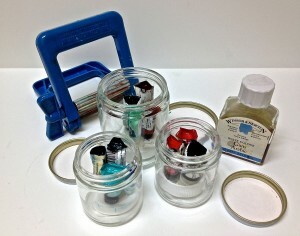 After attaching a few tubes to the lid, I set the tubes inside glass containers with a screw top lid. Mine came from the Container Store, like so many things I use.